The ED Series of machine are design for molding medium to large parts using various types of resins. 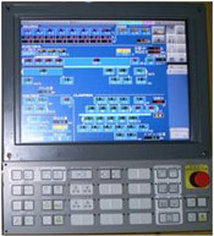 Its unique overall design concept is from Toshiba's proven GS / GT series line of hydraulics which was known large clamp area's with small footprints. ED series machines are exceptional hybrids using servo technology for injection and servo "assist" on the clamp resulting in faster cycles with precision control. More standard features than ever before; Link Line Toggle Unit, Ejection Servo with Brake, Linear Bearings, iPAQET LITE, 15" LCD Touch Screen, as well as high wear Barrel and Screw combinations, Stainless Steal Hopper, Auto Purge, Dual Air Blow and much more.